Ruth Garbutt is a mum looking to regain her pre-pregnancy body. 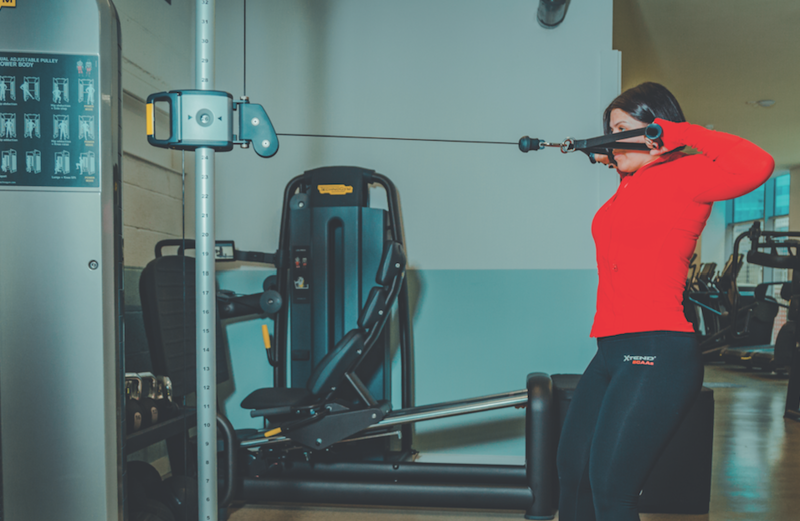 PT Adam Haines knows exactly how to help her do that. The duo has 10 weeks to make it happen… Let’s go! “My main goal is to lose 10kg, though after chatting to Adam we agreed that I should aim to lose more fat than weight,” says Ruth. “It could be that I lose, say, 7kg, but a lot of body fat, and so still get the look that I’m after. When I started, my body fat was 33% so the aim is to get that down to around 20%. I feel good about it. A lot of the weight I’m carrying is, I think, hormonal. I have two kids and I only stopped breastfeeding my son about eight months ago and I gained weight after that, so I feel this is the shock my system needs. I seem to be an expert in gaining weight in pregnancies, but less so at losing it! Well, time to change that. The challenge doesn’t scare me at all. “I think a lot of women will be able to relate to my situation. I’m someone who likes to take care of myself but by having kids my body is now facing challenges that I don’t seem to be able to manage. I’ve had two C-sections, which has wreaked havoc, so I need to learn how to train effectively and challenge all the things I thought I knew about my body. “Ruth’s 10-week programme is split into two-week microcycles,” explains Adam. “In each two-week window she’ll be doing two full-body workouts which will be her ‘bread and butter’. These will work all her major muscle groups and will comprise of mainly compound muscle movements. Then she’ll do two specialisation workouts; for the first two weeks we did arms, and now we’re working on her back. After that, we’ll work on her legs. She’ll also do one or two cardio sessions a week, so in total she’s doing up to six sessions a week. “We’re in week three and she’s doing really well,” says Adam. “I think she’d find it harder if she didn’t have someone working alongside her and pushing her to progress her weights, but that’s the same for a lot of people. That’s the whole ethos of Fitness Space, and the point of a personal trainer. 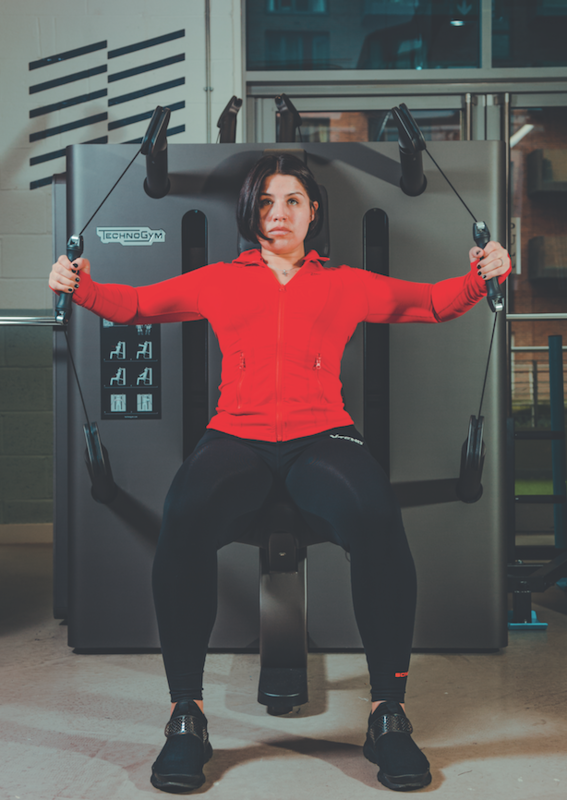 “I’ve found the HIIT and the weights really challenging actually, more than I thought I would, because we’re doing a lot of tempo stuff,” says Ruth. “In the past I’ve been used to banging out sets and reps whereas now I’m slowing my reps down. And there are a lot of reps! The HIIT stuff in particular… I’ve felt really unfit. My body is sore too. I was expecting my body to ache, but I think it’s things like having to pick up the kids that really brings home how much my body is aching. I’ve really enjoyed having a mentor help me through it, though. 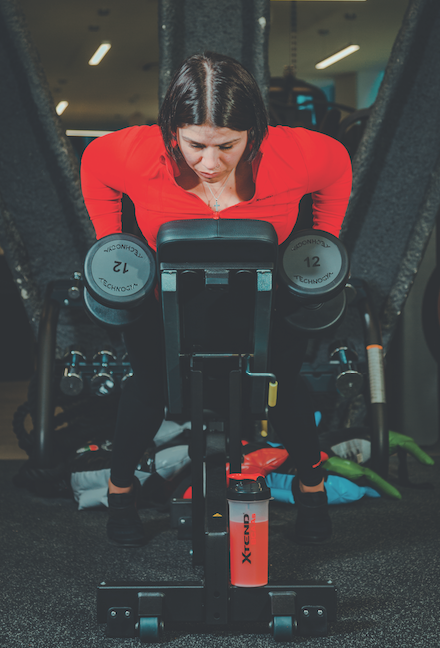 Ruth is taking two supplements: XTEND® HydraSport™ BCAAs, which have been shown to help support muscle protein synthesis, and Cellucor C4® Sport pre-workout, which providers her with ingredients that support energy, performance, and focus. Ruth uses the BCAAs throughout the day to top up her electrolytes and to maintain her hydration levels. She’s not a huge fan of drinking water and these are flavoured, so help her get what she needs. 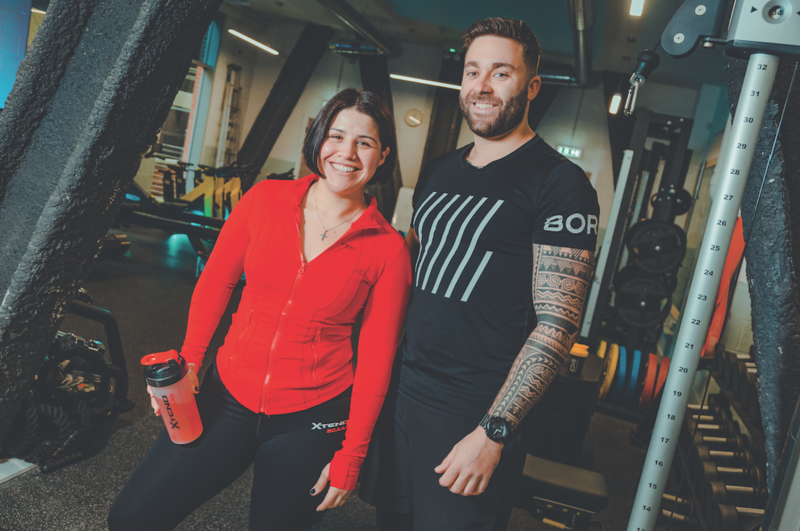 “Ruth doesn’t use the Cellucor C4® Sport every day, but if she’s struggling for energy – she might have had a long day with the kids – she can take this 45 minutes before her session to fuel it,” adds Adam. Do 5 minutes on any piece of CV equipment followed by a bodyweight warm up of 10 squats, 10 lunges, 10 push ups and 5 walk outs for 2 rounds. Ruth is using Shapewatch, a new 3D body visualisation tool that uses augmented reality avatars. 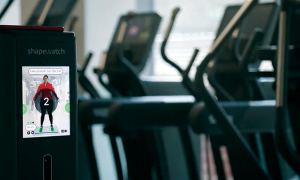 It consists of an automated self-serve kiosk unit that delivers scanning results in 60 seconds, and an app, which lives on the user’s smart device. Together, they offer Ruth a detailed, accurate and highly visual account of her key biometrics – including circumference measurements, body fat percentage, lean body mass and waist-hip ratio so she can keep track of how her body changes as she progresses. 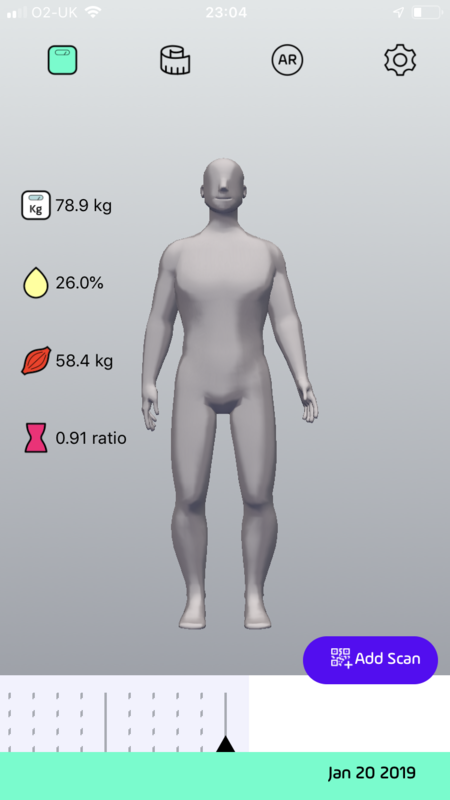 “Shapewatch projects Ruth’s body shape onto an app, and we do this every week,” explains Adam. “The idea is that over time we can track where Ruth is gaining/losing weight/fat and see how her body’s changing, which is really motivational. We do this consistently every week, at the same time of the same day, to ensure we get the most accurate results.” Ruth can also post her progress to her social networks, which will hopefully help motivate her by holding her to account to her followers. Fitness Space gyms are UK-wide.